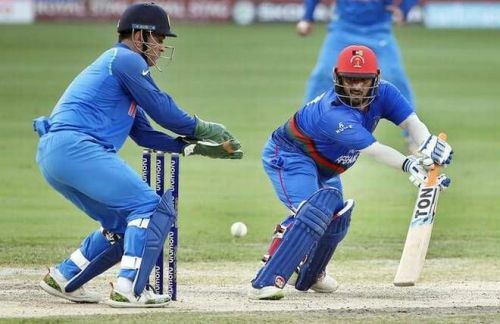 India plays its fifth match of the ICC World Cup 2019 against Afghanistan, which will be the first meeting between the two teams in World Cup history. India and Afghanistan have played each other just twice in the past, in the 2014 Asia Cup and the 2018 Asia Cup. While they have not squared off against each other on the World Cup stage before, they have produced a few entertaining contests, and here, we take a look at the important numbers from the two sides' past encounters. 252 runs scored by both India & Afghanistan in the tied match in the 2018 Asia Cup is the highest team total in matches involving the two sides. 159 all out by Afghanistan in the 2014 Asia Cup is the lowest team total in India vs Afghanistan matches. 146 - Mohammad Shahzad is the leading run-getter in India vs Afghanistan matches. 124 scored by Mohammad Shahzad in the 2018 Asia Cup is the highest individual score by a player in India vs Afghanistan matches. It is also the only instance of a player scoring a century in contests involving the two teams. 6 half-centuries have been hit in India vs Afghanistan matches. 7 - Ravindra Jadeja is the leading wicket-taker in India vs Afghanistan encounters. 4/30 taken by Ravindra Jadeja in the 2014 Asia Cup is the best bowling performance by a player in matches involving the two teams. 3 dismissals by MS Dhoni in the 2018 Asia Cup is the most dismissals by a wicket-keeper in an innings in India vs Afghanistan matches. 2 catches taken by Virat Kohli in the 2014 Asia Cup & Najibullah Zadran in the 2018 Asia Cup are the most catches taken by a player in an innings in India vs Afghanistan matches.